Sample from the Gumsberg VMS Project. Photo by oreal Metals. 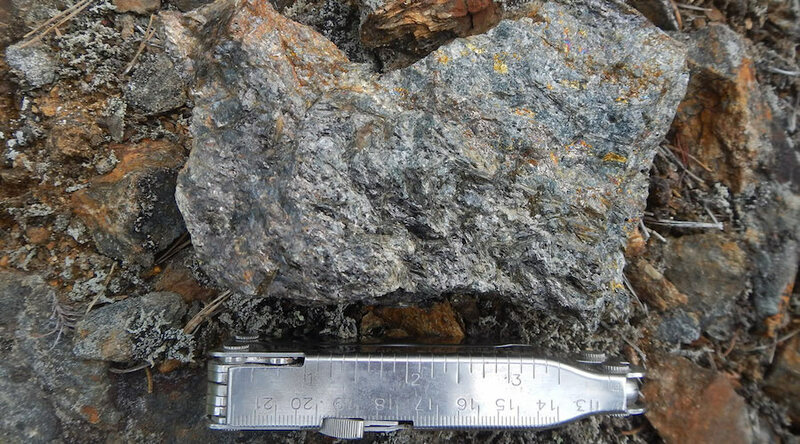 "The drill results include 11.00 meters averaging 5.90% zinc, 239.0 g/t silver, 2.51% lead, and 0.96 g/t gold in hole GUM-18-003, and 11.01 meters averaging 7.45% zinc, 275.1 g/t silver, 2.65% lead, and 0.77 g/t gold in hole GUM-18-004 (true widths estimated at 50% of reported interval lengths)," the firm stated in the media brief. Gumsberg consists of five exploration licenses in the Bergslagen mining district of southern Sweden. According to the companies involved in the project, multiple zones of Volcanogenic Massive Sulfide style mineralization occur in the area, which was first mined in the 13th century. Historic information reveals that up until the early 1900s, over 30 mines operated on the property, notably the Östrasilverberg mine which was the largest silver deposit in Europe between 1300 and 1590. "Despite its long-lived production history, relatively little modern exploration has taken place on the project," the companies said.